I am really happy to know that all of my clients are very happy and satisfied after I have taken them on a private tour in Rio. Have you been with me here in Rio? Use one of the links below to write a comment on TRIPADVISOR and help other visitors to have a great time here in the Marvelous City!!! In Santa Teresa with Alex from New Orleans - USA. 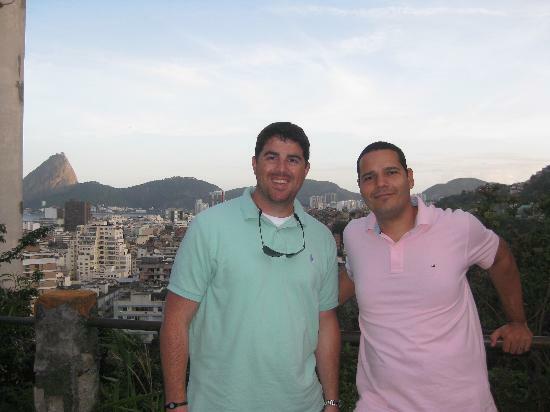 This photo of Daniel Cabral - Rio Private Tour Guide is courtesy of Tripadvisor. Daniel was fantastic. He picked us up (on time) and built our day's journey just for us. His mini-van was perfect for touring, his English was excellent, and he is very knowledgeable and passionate about his city. One of the things that impressed us the most was his willingness to be flexible. After a big lunch at Confeitaria Columbo, me and the wife were pretty zonked out, so Daniel noticed and freely offered to take us back to the hotel so we could nap and further offered to come pick us up another day to finish our tour. It couldn't have worked out better and we really appreciated his thoughtfulness. Guido and Aaron (standing) and friends with myself in Sta Teresa. Daniel loves what he does and it shows in the way he does his job. We came to Rio on a small filmmaking trip and Daniel was a major key to our success. Daniel was very knowledgeable, trustworthy, professional, and fun to be around. We did a one day tour of Rio with Daniel and it was excellent. Daniel was great - he arrived at our hotel on time, his car was clean & air-conditioned and he was a certified Rio tour guide. Daniel spoke very good English and had a good knowledge of the city. He tailored the day to our needs and even tried to plan around when we might get the best, cloud-free views from Christ the Redeemer. My partner and I found Daniel very knowledgable and we a private day tour of Rio at the start of our trip was really useful introduction to Rio that helped us during the rest of our stay. You need a guide to visit Rio? Daniel is the one you need. We did half day tour with him. He knows very well his city. We really enjoyed the experience and recommended him to anyone.